The weather here today was gorgeous, so instead of going down into the 'dungeon' studio, I got outside. When I did come back in to play, I found two challenges which I could use on today's Magazine Monday. 1) I knew I wanted to use one of the images from Sandie Huggett over at The Outlawz Creative Freebie Challenge. I never seem to get my cards in over there in time. I'm surprised they still let me play. 2) S2S12C - The Stamp 2 Spend Challenge at Splitcoast Stampers - Use our favorite pizza as inspiration - and make it round. I'm a garbage pizza person. You'll notice I've picked up the green pepper colors in her socks, Italian sausage on in her shoes color and her dress the color of warm tomato sauce swirled with melted Mozzarella. Her hair also brings in the extra cheese. 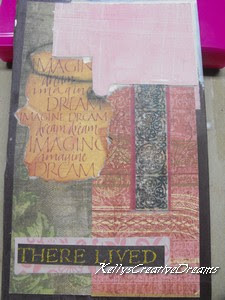 3) While cruising for a magazine with an inspiration card, I found a dreams card in the February 2012 issue of Crafts n Things magazine. It is a design by Sue Czosek. Sue was inspired by a design of a Borders gift card holder. 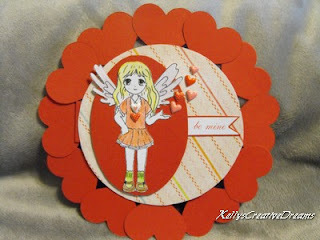 She used it and a sheet of newsprint to create a beautiful round card. Sue's card was a 5.5" circle. I used a 4.5" circle and then a 4" oval mat. 4) And lastly, since Valentine's Day is approaching, I might need one or two more cards to share so I went with the heart theme. 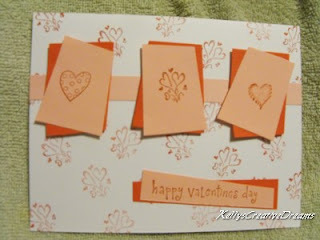 Where I have used hearts (Sizzix Sizzlet), Sue punched flowers from news print and inked them to coordinate with her color scheme. On Sandie's original image, there was a halo above the faerie an where I have the puffy hearts going off to the side off of her hand, they were actually a print part of the image. I chose to cut them away to give a cleaner cut to the main image then added the puffy hearts in their place. I used SU Real Red CS and DP (inside covers), My Minds Eye Candy Stripe and DCWV - sentiment The image was colored with Derwent watercolor pencils. I added EK Succss puffy heart stickers. I love how she turned out and I hope you do to. Plus I'm backing up to actually show my Teapot Tuesday card for this week. It was another one of THOSE weeks where what I had in my head just would not transpire to something tangible. I finally ditched my original concept completely and found a new jumping off point. The card this week goes to Betty. She lives in AZ and has been diagnosed with terminal lung cancer. She loves flowers and her nickname is Sunshine. So I went with Daisies and yellow. I chose a sketch from the SCS Sketch Challenge (SC36) and tweaked it by adding the sentiment bar at the bottom. I also went looking in the SCS Color Challenge (SC36) and found the pairing for the base color of Daffodil Delight I'd chosen to work with. SC36 suggested Concord Crush and Pear Pizzaz. I LOVE Pear Pizzaz and have been ordering a pack every time I place an order because it's an In Color and will be gone this year. 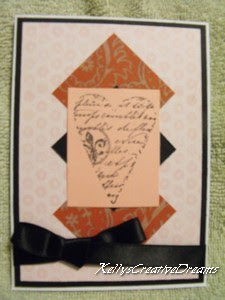 The sentiment stamp is from a set from Studio 112. The Daisy is one I picked up at $Tree years ago. Then there's the Art Journal project Michelle over at the Paper Dog and I are playing with. After Saturday's fiasco of trying to draw a face on the cover, I'm stalled. I loved my cover then after I attempted the face it looked horrid. No, this wasn't the inner voice. I truly looked like an alien. So I painted that area back over with white gesso, then a layer of vintage rose acrylic before adding a piece of the original paper back into place. Next week when I'm not so focused on working on my current novel, I'll have time to sit and play with the face more. Only after I've sketched something I can look at, will I add it to the cover... hopefully for next Thursday's post. In the mean time, I'd love to hear your thoughts on the collage. Teapot Tuesdays are partly about sending love, hope, blessings and a smile to someone who could use a little cheer. I don't have a card for today's TeaPot Tuesday. I'll try for later in the weekend. I've been really focused on working on writing the novel this month and making up for the two weeks of writing I lost. But today's post isn't about me... it's about a Paper Bloggers Unite member. Samantha's grandmother passed away last Friday. As I read her Goodbye, Grandma , I bawled like a baby. You see, her grandmother was the type of woman I am trying to be for my granddaughters. Everything she describes she did with her grandma, I have been doing - or will do as Adrian grows up. And I'll do them with Abigail when she gets older (she's only 3 months old now so I hope I have time). Samantha has lovely memories of times spent doing things with her grandma. I hope those memories will bring her love and comfort in the days ahead. But in the mean time, would you please drop by her blog - Blissfull Domesticity- and leave her some love? It appears as if we're to have a beautiful day in the Ozarks. When I get days like this it motivates me to try and conquer the world. We'll see how I do. For today's card, I have the remake of the card gone bad I had attempted for last week. 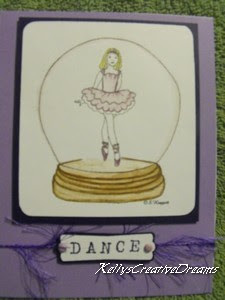 The card was inspired by 'Funky Birthday' in a 2005 issue of Stamp It! I tried to locate the artist, Julie Medeiros without success. I stuck with her layout but changed the theme and colors. She had chosen Olive green for her base, deep red for her ribbon strip and the base of the sentiment. Her sentiment was stamped on sky blue and it was used for the base mats on the images. Julie used the present, party hat and cake from Let's Party (retired SU) and stamped everything in a blue dye ink by Hero Arts. The alphabet blocks to spell Happy Birthday were also Hero Arts. 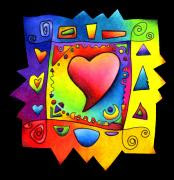 The heart explosion for the background and the heart image on the far left are from Doodles By Design. The other heart is from an old Valentine foam set I've had for years - you know, back when you bought stamps before more refined options came along. The sentiment is my Katie & Co. I'm still trying to use up my ValuCS so I can use those two file drawers for something else. I used Primary Red and Baby Pink. Everything is stamped in SU Real Red. I'm proud of myself for not trashing the original but instead, making it work. Here's to a great creative week! Friday Frenzy can be anything from a current project I'm working on to a Challenge(s) card. Today I'm showcasing a Challenge card for The OutLawz Creative Freebie challenge. The ballerina figurine under glass was created by Sandi Huggett. This was such a pretty image to work with. I want to mess with it again at some point and try for some dimension with the globe. I printed the image out on GP white and rounded the corners to complement the globe. I used Derwent watercolor pencils for the image. For the top of the wooden base, I didn't add any extra color, just the 'wash' that was left on the end of my water brush. I used SU Concord Crush matted against a SU Lavender Lace (retired) base. The letter stamps are Antique Alphabet by EK Success. Two Lavender brads help draw the image out of the globe. Dance and girly must have some frill so I chose this feather fiber in the darker purple. I've already downloaded the 2 new freebie images from Sandi for the next challenge round. They are Valentine themed. I'm looking forward to working with them. Today begins a series of something I love to play with but don't devote near enough time to... mixed media art. I don't think I've very good but then again, being any good at art is irrelevant. Truly, 'good' is in the eye of the beholder. 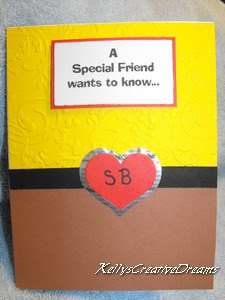 Last fall I met a wonderful person on Splitcoast Stampers. If you look over under my Paper Bloggers Unite list, you'll see The Paper Dog. That would be Michelle. As soon as I found out she loved art journals, we started chatting. And something just clicked! I love when that happens. It's like you've been friends forever. In six months, that's the way Michelle and I have become. 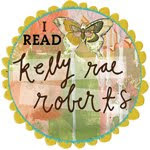 We decided for our first joint venture, we would walk through Taking Flight By Kelly Rae Roberts. I'll talk more about the book next week, but actually delving into a long-term project prompted me to get my art together. I mean everything in my stamping studio is organized, my writing life is organized but the tools of the art trade seemed to be everywhere in the house. Last week while in Springfield I found this soft-sided scrapbook tote for 50% off. It's brown, cream and black. 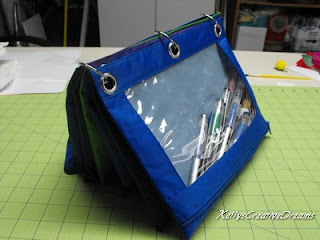 There were just enough pockets to hold the basics plus space to add specific items for individual projects. As you'll see from the photos, I have it well organized. I wanted to make sure I could get to everything easily. 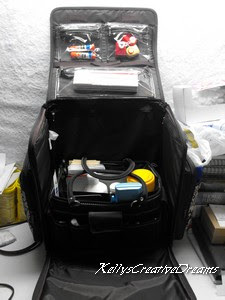 And if I ever attend an art retreat, I can keep my tools somewhat contained, not infringing on someone else's space. The inside of the flap has three pockets. 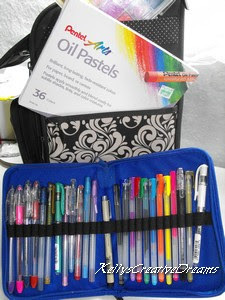 I've designated one for glue sticks, one for small punches, and one for my water color pencils and brushes case. Each end has a big zippered pocket plus an open pocket. Not shown, but the zippered pocket on one end of the bag is full of Tombo Mono adhesive refills and some cardboard sheets. Can never have too much adhesive on hand when working a project. That's why I order mine by the case from Penwa office supplies. Their prices are reasonable (about $1.85 per refill as opposed to over $2 -with coupon at the craft stores- when purchase by a case of 100). They also ship in a reasonable time frame. 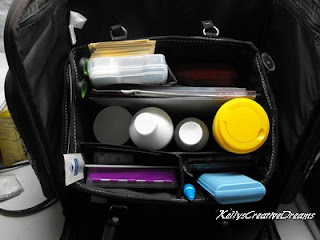 The other end pocket holds my chalks and oil sticks in the zippered compartment and the pen keeper with all of my gel pens and fine black writing pen in the open pocket. I LOVE all the colors I have to work with. There is a big zippered pocket across the front that for now is holding my small alphabet stamp sets. These are by Studio G and sell at WM and Michaels for $1 per set. They're the perfect size for journaling or small ring tags and ATCs. But the real treasure is inside the big open compartment. I had this multi-pocket bag from my days as an instructor at Michaels. 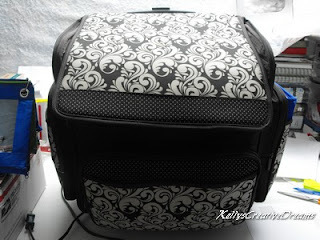 I emptied it when I had Bob build that sectioned compartment along the front edge of my work table to hold all my scrapbooking tools. It fits perfectly within the main storage space. Within the parameter pockets I have a misting bottle, bottles of stickles in various colors, cutter replacement blades, basic office supplies, Mono applicator and dimensional glaze. The inside pockets are large enough to hold my containers of Gel Medium, White Gesso and Clear Gesso. 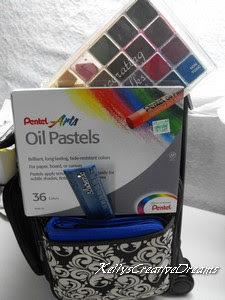 I also have dry baby wipes, needle mat, various applicators like chenille balls and Qtips, and CS mats for tags and a container of Watercolor paper mats, clear stamps and acrylic blocks. 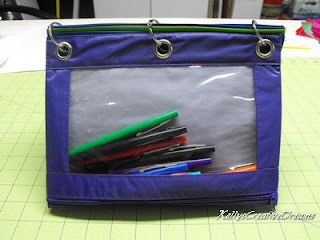 When this bag is stowed away in place, I can place my writing instruments book on top, as well as my paper trimmer. The writing instruments book is composed of Elmer's Pencil Pouches in various colors and held together - book style - with 3 ring clips. Each pouch holds something different. Twistable colored Pencils, broad tip markers and Flair Pens. 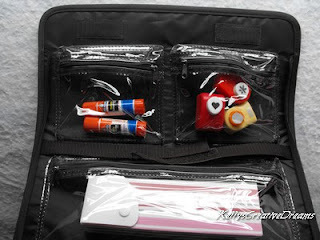 This keeps all of the writing items together (and horizontal for longer life). Plus I can stand it up easel-style in front of me and flip the 'pages' to the items I want. Wherever the creative journey takes you... go in style! I have so much stuff in my studio, it's hard to know what to play with. And I find myself going back to the same old stuff... or should I say new stuff. Do you work that way? I decided for this year I want to work on the 'reuse/ reduce/ recycle' concept a bit more. So every Wednesday I'll showcase a project that has something recycled on it. It might be the base of the whole project, or it might be something as minute as a small piece of paper... like today's project. During Virtual Stamp Night (VSN) at Splitcoast Stampers last fall we were given a challenge to use 'recycled' wrapping paper in our card. We couldn't take it off the roll new. It had to be some that was 'saved' from a previous Christmas for whatever reason. Come on, admit it... you have some! My plan was to have a Christmas tree with presents around the base. All the presents would be from recycled Christmas wrap. I spent the entire evening (notice I didn't say 'wasted') trying to make my plan work. The presents just didn't work right. So I went to my trusty PrintShop program and found an image of a stacked row of presents. Can you spot my wrapped packages in the card below? One is easy to spot... it's the Santa on the far left. 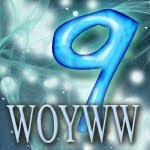 The other one is the blue package right under the 'creative' part of my watermark. I cut the shapes of those two packages out of white card stock then adhered them to scraps of wrapping paper and glued them into place over the existing packages in the preprinted strip. The card base is SU Pacific Point. I used a scalloped oval from Cricut cart: Lacey Labels. 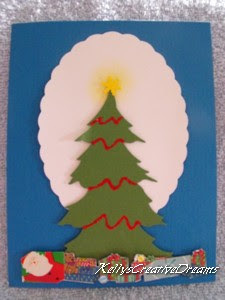 The tree is from an Original Sizzix Die (retired). I added the garland with Red Stickles. The star is a small snowflake punch. I determined it's position on the mat and chalked behind it with SU Daffodil Delight. The package strip is popped out with pop dots to give them a bit of dimension. Okay, not a big recycle project but it's where I'm at as I try to get caught up after being off work for so long. Remember: every piece we reuse isn't sitting in a landfill contaminating Mother Earth. Yep, running a little late.... okay... by several hours late. But with good reason. I'm usually 'one of those' who can look at a design and know exactly what I want to do... and have it work the first time around. This week, when I needed it to, was not the case. I went to my magazines for inspiration last night and found a layout I thought would work. It was a cute and simple card. So I set to work putting it together. I hated it. Yep, I couldn't bring myself to even photograph it, let alone post it to the blog. So I called it a night. This morning began Bob's last day home before he leaves for 3 weeks. Try as I might, we just can't seem to NOT have to go anywhere on his last day. It always means last-minute errands. So before I could go back to the card, we had to leave the house for the day. As soon as we got home (about 2 hours ago) I headed back down to the studio, put last night's card aside and pulled out a new magazine for inspiration. The very first card I spotted was the one I knew I wanted to do and it came together in 10 minutes. I went back to the Spring 2006 issue of Take Ten and found a card called Solo Shoe by artist Clintine Steele. You can see her on FB at Bean Up The Nose Art. Clintine's card was a 4.75 x 6.5 laying horizontal. She used a black and grey polka dot pattern on white paper, edged with black on the top and bottom as her base. Across the center she put 2 red squares and one black one as the second layer. Then the solo shoe image went on a white rectangle, stamped in black. She colored the bow on the shoe in red and used a black pen to apply a dot border around the edge of the mat. A very basic and elegant card. To create my version, I flipped mine vertical, used SU black CS for the first mat and a scrap of pink dot patterned paper for the 2nd mat. My center mat squares were from a red oriental patterned scrap and SU black CS. I stamped one of the heart images from the new Hero Arts 'Untitled Hearts' stamp set with Memento Tuxedo Black on baby pink Valu CS (I'm trying to use it up and get it out of here). I added a black satin bow. I wanted something a little lighter but the satin was all I had. I like the way this one turned out though I think next time I'll use a slightly smaller image so more of the black mat square will show at the top and bottom. Joshua (not Josh) loves Sponge Bob and Legos. Well, I forgot the Legos part but I knew I wanted Sponge Bob to be the center of attention on the inside of the card. I used the Starry Night #2 CB folder on yellow ValuCS. I placed brown Valu CS to represent his pants. Because it's a valentine, I put a red heart over the belt where his tie would normally hang. The inside is covered in a misc. water print paper from my stash and everything else was computer generated. 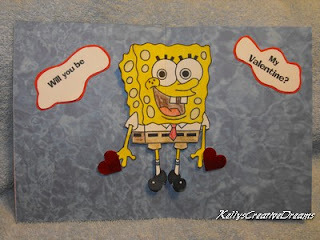 I used Socket font and the Sponge Bob image is from 4kraftykidz. I added a couple of glitzy heart stickers. The only thing left to add is a bubble in the bottom corner with my name and location. The Tea Potters at Splitcoast Stampers are a pretty awesome group bringing love and smiles to people all over the world who could use a little bit of cheer. Won't you join us? It's way more fun than should be legal! With the head cold working it's way to where ever colds go, I'm back to creating again. I felt so good last night I didn't want to leave the Studio. 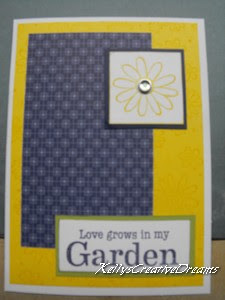 I created today's card plus cut the base mats and stamped the images for 9 more. Yep 10 more Christmas cards for 2012 will be done by the end of today. 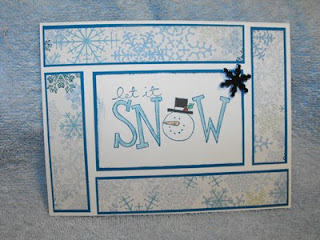 I was inspired with today's card from a member of our Christmas Card Challenge 2012 members. Colleen (Katchoo1 on SCS) showed us her January card using a layout she used back in 2006 in the spring issue of Take Ten. You can see her card HERE. Although I have several back issues of Stampington publications, this was one of only 2 back issues of Take Ten I have in the Studio and am glad it was. WOW! Base Mat - Cut 2- 5 1/8 x 1" + Cut 2- 3 5/8x1"
DP - Cut 2 - 5x7/8 + Cut 2- 3.5x 7.8"
Base Mat- Cut 2- 4x1" + Cut 2- 2 5/8x1"
This card also fulfilled the January Challenge for the PBU thread at Splitcoast using the theme 'Let It Snow' direct our creativity. 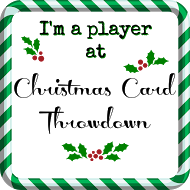 My next plan is to pull out my scrap drawer, cut the DP strip sizes I need and then match with CS to make several cards for the All Occasion Challenge thread. I already see one in browns and earth tones with Noble Deer featured in the center for guy cards. I hope your 2012 is off to a creative start! Collage hasn't changed much over the years. It's still about cutting pieces of this, pictures of that and a little bit of everything else from our creative stash and gluing them to a surface. The end result is a beautiful, recycled piece of art. When playing with our art mediums, it is so easy to get stuck in the rut of doing the same old thing every time we pull out our toys. In Collage Playground: A Fresh Approach to Creating Mixed-Media Art by Kimberly Santiago, we are introduced to 25 projects and 10 simple crafting techniques that bring the art of collage to it's pinnacle of creativity. I have Kimberly's book, Altered Book Pages and refer to it frequently when looking for a way to do something different. Funny thing is, most of us have all the things we need to create beautiful pieces of art. We just get attached to our favorites and forget about the gems just waiting for their turn. Kimberly reminds us to pull those treasures out and let them shine. Whether you are into Art Journaling, Mixed Media art forms or Scrapbooking, Collage Playground offers tips for every artist. And yes, you are an artist. If you like to dream, explore and create, you ARE an artist. And if you'd like a chance to win a free copy of Collage Playground, follow this LINK. This week I'm not sharing inspiration from a magazine. I've joined a new group of creative people called The Outlawz. A couple of their members, Sandi Huggett and Anne Fenton, do beautiful digi images and offer up 2 Free every two weeks. To get the next ones, all you have to do is make something using the current freebies. 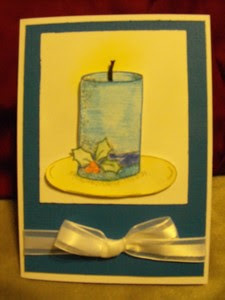 Last week I squeaked in just under the wire with this candle card. I used Pacific Point as my mat and colored in the candle an charger with Derwent watercolor pencils. The wick is a 6-strand piece of black embroidery floss. Tomorrow is a very special Teapot Tuesday card.